The Archangels are called the great heralds of good news, announcing the great and most glorious. 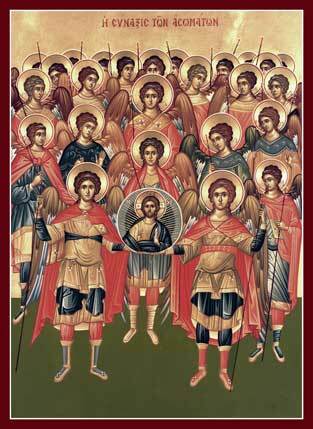 Their service (as St. Dionysius the Areopagite says) consists in revealing prophecies, knowledge, and understanding of God's will which they receive from the higher orders of angels and announce to the lower order, i.e., the angels, and through them, to men. St. Gregory the Dialogist says that the archangels strengthen people in the holy faith, enlightening their minds with the light of knowledge of the holy Gospel and revealing the mysteries of devout faith. As it is shown in the Book of the Holy Prophet Ezekiel throughout (compare with the Book of Revelation), the first four archangels (Michael, Gabriel, Raphel, Uriel) are the ones that stand in the four corners of The Great Throne of God (the Ma'aseh Merkabah). Together with them stand the four six-winged Living Creatures (Ayyot), the four many-eyed Cherubim—having four arms, four wings and four faces each—and the four many-eyed Wheels (Ophannim) or Storm-Winds (Galgallim), which Christians, (according to the example of the Great Apostle Paul and that of his illustrious disciple, St. Dionysius the Areopagite) call Thrones. These four archangels are the ones that protected the four camps of the people of Israel in the wilderness: to the North, to the South, to the East and to the West. They are the angels of the four winds, according to the Scripture that says: "[You] Who maketh his angels spirits [literally, winds]; his ministers a flaming fire" (Psalms 104:4, KJV). From the Western tradition: (H)anael or (H)aniel; Jophiel or Cassiel; Zedekiel or Sachiel. The explanation and translation of all of these names can be seen below, but the Oriental and Eastern traditions have one more archangel in common, namely the sixth, called Selaphiel. Likewise, it's worth noting that the last three archangels of the Eastern tradition represent the three forms, or types, of prayer: blessing, supplication and praise. Also, Zadkiel is one of two standard bearers (along with Zophiel) who follow directly behind the Archangel Michael as the head archangel enters battle. Michael: "Who is like unto God?" Dan. 10:13; 12:1; Jude v. 9; Rev. 12:7-8. Gabriel "The Powerful or Strong Man of God," "The Power or Strength of God" Dan. 8:16; 9:21; Luke 1:19-26. Also called Djibril or Jibril. Raphael: "The Healing of God" Tobit 3:17; 12:15. Also called Israfel. Uriel: "The Light or Fire of God" A.V. II Esdras 4:1. Also called Sariel, Suriel, or Muriel. Selaphiel: "The Command, Communicant or Prayer of God", since command and prayer represent the two forms, or types, of communication: the first one being descendant and the second ascendant. Also called Salathiel, Selathiel, Seraphiel, Sarakiel, Saraqael, Zarachiel, Zerachiel, or Zachariel. Jehudiel: "The Glory, Laudation or Praise of God." Also called Jegudiel or Gudiel. Barachiel: "The Benediction or Blessings of God." Also called Varachiel. Raguel: "The Friend of God." Also called Raziel, which means "The Secrets of God." Not to be confused with Raphael. Jeremiel: "The Compassion, Exaltation or Mercy of God" R.V. II Esdras 4:36. Also called Jeramiel, Jerahmiel, Jerehmiel, Ramiel, or Remiel. Anael: "The Grace or Joy of God." Also called Aniel, Hanael, or Haniel. Jophiel: "The Beauty of God." Also called Orifiel, Jouphiel, Zouphiel, Zophiel, Zophkiel, Zaphiel, Zaphkiel, Kaphziel, Cassiel, or Kepharel. Zadkiel: "The Justice, Righteousness or Uprightness of God." Also called Sachiel, Tzadkiel, Zadakiel, Zedekiel, or Zedekul. Lucifer/Satan: "The Light-Bearer" or "The Morning-Star" Isaiah 14:12; "The Enemy" Jude 1:9, Revelation 12:9. Other names for this fallen archangel (or his companions) are: Azael, Azazel, Azrael, Izrael, Izreel, or Uzziel; Camael, Camiel, Camniel, Cancel, Chamuel, Kemuel, Samael, Shemuel, Simiel, or Zamael; Samiaza; Satanael. This page was last edited on June 14, 2016, at 14:23. This page has been accessed 176,575 times.